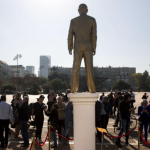 For the statue to be cast in gold is an obvious reflection of the idolization of Netanyahu, where his illegal West Bank settlements, massacres of Gazan civilians, and domestic apartheid policies towards non-Jewish Israelis are widely supported. To be sure, 66% of Israelis believe Palestinians living under occupation shouldn’t be able vote, while 75% support segregated roads for Arabs and Israelis. Reportedly, there was a mix of reactions to the statue, with some agreeing with its commentary, some finding it to be an actually honorable depiction, while others understood, but were highly offended by the mocking of their prime minister. Authorities ordered Zalait to remove the statue, but rather than take it down himself, the artist invited the crowd to topple it for him in an unwitting performance act reminiscent of the Baghdad photo op of Saddam Hussein’s own statue being toppled in 2003. The public plaza where this took place was in itself significant. Rabin square was the site of the assassination of former Israeli prime minister Yitzhak Rabin – moments after a rally for the Oslo peace accord which Rabin championed – by a far-right radical and opponent of peace with Palestine. Netanyahu was not only opposed to the Oslo accord as well, but actively worked to undermine it while whipping up right-wing opposition. Monsters like Netanyahu will always find themselves on the wrong side of history when artists and free speech advocates assert their right to the commons, to public space, to art, and to human morality. While dissent is frowned upon in Israel, there are those like Jewish Voices for Peace and Haaretz who continue speaking out for justice for all Israelis, immigrants, and Palestinians.